"It is a rare print that can claim a history of persecution. 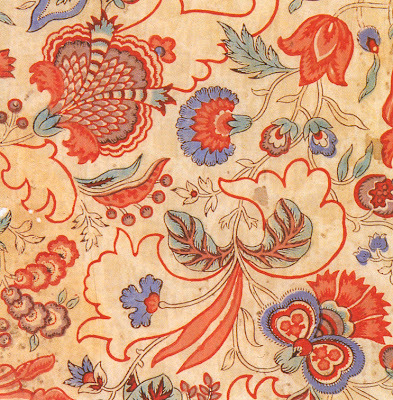 Indiennes are French interpretations of Indian hand-painted cottons. Introduced to Europe by the East India trading companies in the seventeenth century, the foreign cottons grew to in such demand that they threatened local weaving industries and were banned. In France from 1686 to 1759 and in England from 1700 until about 1764, they could neither be imported nor worn. Accordingly, they became immensely popular, even though in France the punishment for breaking the laws included the death penalty. In the French free port of Marseilles, which was protected from the import laws, Indian cottons were both traded and copied, and then smuggled throughout the country. Since they could not be worn publicly they were worn in private, lending domesticity the pleasure of the illicit. Even after they were legalized they remained in great demand. Indiennes became a specialty of the Chrisophe Philippe Oberkampf mill in Jouy and survived the French Revolution to endear themselves to Napoleon and Josephine - and to the public ever since." - Textile Designs: Two Hundred Years of European and American Patterns Organized by Motif, Style, Color, Layout and Period by Susan Meller and Joost Elffers.